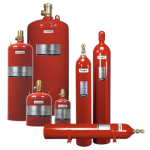 Industrial Fire Suppression System has been pre-engineered for industrial hazards like paint spray booths, dip tanks, and flammable liquid storage rooms. Using water as a fire suppressant in areas where electronics operate and irreplaceable, high-value assets are stored, could be as devastating as fire itself. A Clean Agent System quickly suppresses fires and protects sensitive equipment without causing harm to people or the environment. 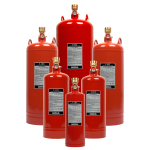 The system is especially suited to suppress fires in areas where an electrically non-conductive medium is required, where electronic systems cannot be shut down in an emergency, where cleanup of other agents poses a problem, and in normally occupied areas that demand a non-toxic agent.